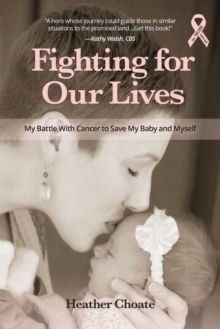 True story of survivalMother and unborn child beat cancer through faith and determinationOne of the truly remarkable stories of faith and determination: At age 29, Heather Choate was diagnosed with breast cancer. She was ten weeks pregnant with her sixth child. Her unborn baby became victim to the fast-spreading and highly dangerous cancer in Heather's body that already spread to her lymph nodes. Doctors told her she needed to abort her baby to save her life. Heather told them, "I'd rather die than take the life of my baby." Heather and her husband set out to find a way to save both mother and baby. The journey pushed them to the fringes of their stamina, tested the strength of their familial relationships and found them clinging to their faith like it was the last bit of thread on a lifeline. Reading true stories of survival may change your life: We all have unexpected adversity in life. It's those things that we think "will never happen to us." It could be the loss of job, the birth of a special needs child, the downturn of the economy or an unexpected health challenge. Most of us would easily crumble under such circumstances, but Heather found that its not about what happens to you, its about what you do with it. You don't have to almost die, to learn how to live and Heather shows us how. Despite adversity, nearly impossible challenges can be met, families can be strengthened and faith can sustain even the most desperate souls on their journey. She brings her role as cancer warrior into the real lives of readers, addressing topics that affect them most: dealing with doubt and insecurity, discovering who they really are, renewing their passion, negotiating family strife, releasing relentless regrets, succeeding against temptation, weathering their worst fears, pressing on against fatigue and illness, uprooting bitterness and more.